Following our report from earlier today, Apple has launched its new entry-level 16 GB fifth-generation iPod touch, while also cutting the price on the current 32/64 GB iPod touch, offering them for $249 and $299, respectively. 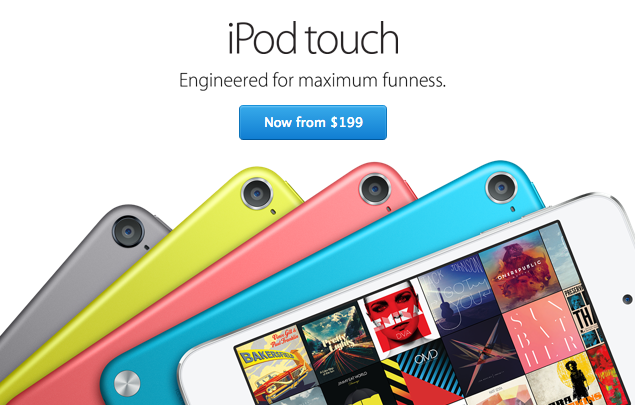 The new iPod touch is available in six different colors with a rear camera and a lower price tag of $199. The 16 GB model now offers the same features as the larger capacity models, although the Loop wrist strap is sold separately on the 16 GB model and included with 32 and 64 GB models. The fifth-generation iPod touch originally debuted in October of 2012 with a $299 price tag, but Apple expanded the lineup with a lower-cost, silver-only 16GB model that shipped without a rear camera and lower price point of $229. This new $199 16GB model replaces the $229 model in Apple's iPod touch lineup. We took the same two-year-old iPod and decided to sell it at a lower pricea price redesigned from the ground up. Hopefully this sets a precedent whereby storage doubling is $50, and not $100 (which is obscene, frankly). Is this apples amazing product plan this year? just barf out the pretty much same products they´ve had with slight modifications for a lower price. It´s ALL they released this year: MB air with less than 10% speed increase, iphone 5c 16gb model, a crappy iMac model, and now a slightly modified ipod touch....talk about riding on old waves. An extra 64GB of storage for $51? Good luck with that. What??? They can't even include the loop for the 16gb model, and this has to be bought separately? Seriously, how many cents does that look cost to be manufactured? The most prolific period of innovation and new products in Apple's history. I hope the $50 to double memory will apply to the iPhone as well. if you think this you're not a regular iPod touch user. i've been carrying one in my pocket for 3 years. why? no monthly fee! Phone calls I don't make much, especially while i'm able to contact people via texts, email and FaceTime audio. I carry with me a cheap prepaid phone which maybe cost me $25 every 90 days. This is who the IPT is for alone with teens. Public wifi is also becoming more available. if you used an IPT regularly you'd be amazed at how many places are around. If you want I can call you for free and tell you about it via FaceTime audio. I think this will be the iPod Touch's last hurrah. This is a dead product line.